Or are you a stranger, without even a name? Forever enshrined, behind some glass pane? And fading to yellow, in a brown leather frame? Perhaps because so little has survived, the few photos and original documents that I have of my great uncle Jack are treasured possessions for my family. They help to make real the legend that I grew up with. They are, literally, all that is left of the man. And for this reason, it’s critically important that I keep them safe. When Dad was given the photos from his grandfather they lived in a shallow foolscap box. But by the time I saw them in the early 1990s the box was falling apart. Given my developing interest in the photos and the story they represented, something more practical needed to be found to allow them to be easily accessed. They spent the next few years in plastic sleeves in a green display folder, along with all the other material we’d gathered. A few years later Dad found an old leather briefcase in an antique shop somewhere, and thought it would make an appropriate home for Jack’s memorabilia. He arranged the photos around Jack’ logbook in the briefcase, which sat open in a display cabinet at my parents’ place in Goulburn until he gave them to me earlier this year. An antique cabinet at home serves as my ‘Pool Room’. I was keen to display Jack’s memorabilia there, along with other meaningful objects like the forage cap and my Lancaster model. (Not entirely coincidentally, the original oil painting of B for Baker hangs on the wall above). But some of the photos are fading and curling a little. Wanting to display them but not wanting to run the risk of further degradation, I needed another solution. So I now have copies on display in my cabinet. Digital copies are available for study as part of my research if I need to, or for posting on this blog. But the originals have an atmosphere to them that the copies can never replicate. In part it is those imperfections collected over seven decades – the fading, the creases and the pin holes in some – that give the originals their character. Phil Smith’s handwriting on the back of one or two adds to their authenticity. But while those imperfections add to the character of the originals and help make them ‘real’, there’s not much point if the photo degrades to such an extent that the original can no longer be viewed. To prevent further deterioration I have now mounted the original prints – seventeen of them in all – in a loose-leaf archival quality album, using photo corners. The album is now stored in a closet in my house where the temperature will, hopefully, remain reasonably constant. That way the photos are still easily available for closer examination if I want to get them out, but they are also stored as best I can in conditions that will not accelerate the aging process and the deterioration that comes from it. They should last another couple of generations at least. My sister has a degree in archaeology, and to celebrate her graduation a few years ago my father created an ‘archaeological dig’ in the back yard, smashing old plates and mixing in a rusty spoon or two for her to excavate with her brand new trowel (because, as everyone knows, every archaeologist needs a trowel). So finding a real-life pile of old stuff buried under your wife’s irises would, I’d imagine, be pretty exciting. But Mr Holmes found something else hiding away in the old medicine cabinet. Something with even more of a story. They looked like coins at first. 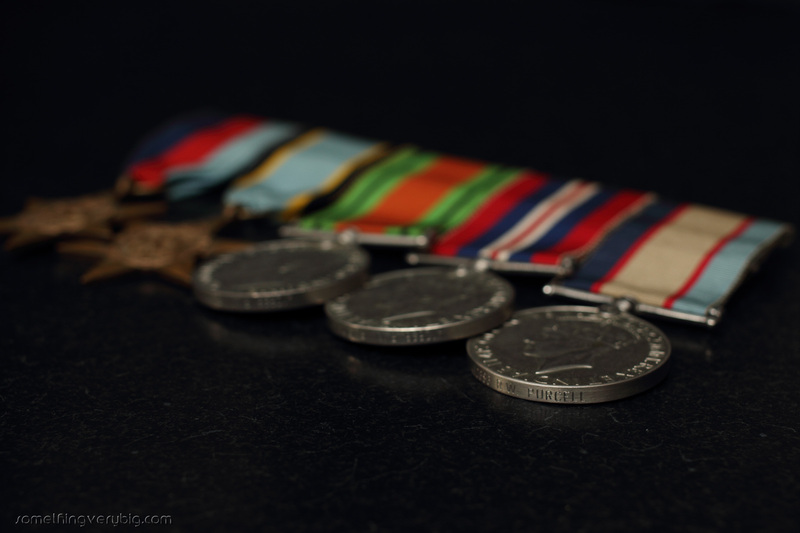 But when he pulled them out, Mr Holmes realised he had found a pair of war service medals. He took them to the secretary of the local RSL club, a man named Phil Carter. Mr Carter was able to identify who the medals belonged to because the soldier’s name is engraved around the rim: a WWI soldier named Private George Bailey. Cunningham writes that Bailey enlisted in Ballarat in April 1916, served with the 39th Battalion and was killed in a gas attack in Messines, Belgium, in June 1917. His brother – Frederick – lived for many years in the house now occupied by Mr Holmes and his wife. I can certainly relate to this feeling. After seriously studying the story of my great uncle Jack and the rest of his crew over the last six or seven years, I genuinely do feel as if I know the lads, even though six of them were killed forty years before I was born. The feeling is all the stronger for those members of the crew for whom I have letters or diaries written in their own words, in their own hand. But to find those, of course, I first needed to find their families, and, well, that took a while. Amazingly, though, less than a week after Melissa Cunningham’s first article was published in the Ballarat Courier and The Age, the search for Private George Bailey’s family came to a successful conclusion when Frederick Bailey’s grandson came forward. If only it were that easy when I was searching for families of the crew of B for Baker three or four years ago! We initially thought that Jack Purcell’s service medals had been lost in the years since the war and so almost 20 years ago my father enquired about the possibility of acquiring replicas. Imagine our surprise, then, when we discovered that in actual fact they had never officially been issued. Dad duly jumped through the multiple bureaucratic hoops that were required to prove that we were entitled to claim them and one day in 1996 a small box arrived by registered post. Inside were five medals – three circles and two stars – and their associated ribbons. And, yes. Stamped around the edges are Jack’s name and service number. Most of the 40 or so locations around Australia that hosted aircrew training units during WWII are still in use today as aerodromes, both civil and military. Some are better-known than others. Mascot, for example, where the current Sydney International Airport is located, was No. 4 Elementary Flying Training School. Essendon – No. 3 EFTS – was, for a time, Melbourne’s main airport and remains in use by corporate aircraft, emergency services, freighters and trainers. Amberley and Pearce are still RAAF bases. While some were abandoned post-war (Cressy in Victoria, for example, or Uranquinty in NSW), a large number of the others are in use in regional and metro areas of Australia. Forest Hill – No. 2 Service Flying Training School – became Wagga Wagga Airport, now a reasonably busy training, maintenance and RPT hub for regional airline Rex. Many navigators trained at No. 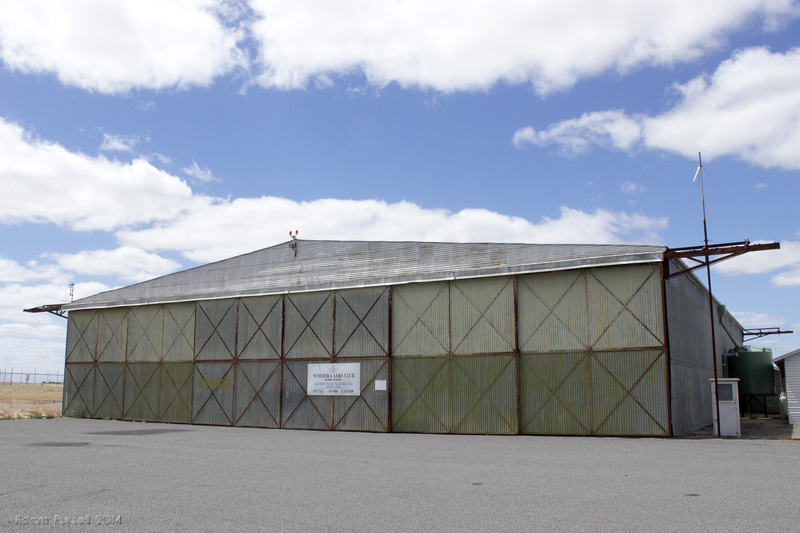 1 Air Navigation School in Parkes, NSW, which remains active as a regional airport. And about five years ago I landed my last aeroplane, appropriately enough a Tiger Moth, on the grass runway at Camden, outside Sydney, which hosted for a time the RAAF’s Central Flying School where flying instructors were taught their trade. Jack Purcell trained at four airfields in Australia, and all remain active. After he was scrubbed from pilot training at 8 EFTS, Narranderra (which today receives multiple scheduled air services each day to and from Sydney), he re-mustered and began his navigator training at No. 2 Air Observers’ School, Mount Gambier (hosting air services to Adelaide and Melbourne). Then he was posted to 2 Bombing and Air Gunnery School at Port Pirie, South Australia (a regional town on the eastern side of the Spencer Gulf). And finally, before being awarded the half-wing that denoted a qualified navigator in July 1942, he spent almost a month at No. 2 Air Navigation School, just outside the western Victorian wheatbelt town of Nhill, on the highway half-way between Adelaide and Melbourne. Rachel and I happened to spend a night camped in the caravan park at Nhill on the way home from a holiday to Kangaroo Island late last year. Knowing that the name crops up in Jack’s logbook, I thought we might be able to have a quick look at the airfield to see if we could find interesting remnants of its wartime history. I was completely unprepared for what we actually found. The first sign that something good is going on at Nhill was, quite literally, just that: a new-looking brown road sign. It was pointing, it said, to the “Historic RAAF Base”. Excellent, I thought, we’ll follow that in the morning. We arrived at the caravan park where a westerly wind was howling as we set up the tent. The roar of trucks passing on the highway was almost drowned out by the squawking and screaming of hundreds of white and pink corellas as they wheeled and soared and swung overhead. Walking around the town looking for somewhere to have breakfast the next morning, we found a display in an otherwise empty shop window for the Nhill Aviation Heritage Centre. I rang the telephone number and was put on to a lady named Joan Bennett, who is the Secretary of the group. She readily agreed to open up the hangar at the aerodrome for us to visit. And so an hour later after breakfast in a local café, that’s exactly where we headed. Unexpectedly, and despite the almost constant truck traffic, Nhill is a rather pretty little town. Heritage buildings line the main street and a long park, with bandstand and war memorials, sits between the two carriageways as the highway passes through the town itself. The smaller of the two memorials looked, to me, to be quite new. 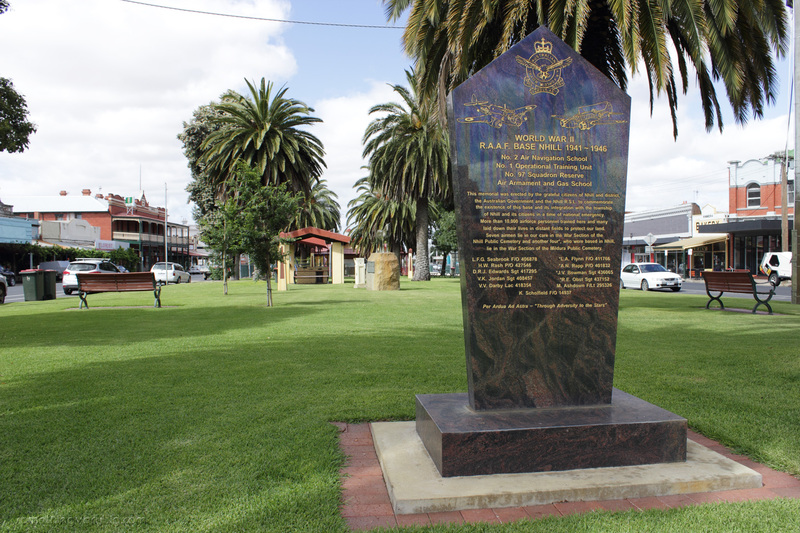 And so it proved, being a memorial set up by the Nhill Aviation Heritage Centre in 2011: The northern end of the town is dominated by the concrete silos of the former Noske Flour Mills. When it was built in 1919 this was apparently the largest concrete silo in Australia. No doubt it was a significant landmark for trainee navigators during wartime. About two kilometres northwest of the town is the airfield. In 1938 an Aeradio station began operating at Nhill. This was part of a national network of air/ground communications stations set up to give comms and navigation support to civil aircraft flying around Australia. It was, in effect, the forerunner of the Flight Service network which eventually developed into the enroute air traffic control system we now use. The first building we passed, right next to the road along the western boundary of the aerodrome, is the former Aeradio site. It looks to be in some disrepair but out of the seventeen original sites around the country this is, it seems, the most original and the best preserved, and so moves are afoot, in cooperation with the Civil Aviation Heritage Society based at Essendon Airport here in Melbourne, to restore it and turn it into part of the Nhill Aviation Heritage Centre. There are two hangars at Nhill Airport. One is the last of five Bellman hangars built at Nhill during the war. It currently hosts the Wimmera Aero Club: The other is virtually brand new. It was built in 2013 and officially opened in May 2014. 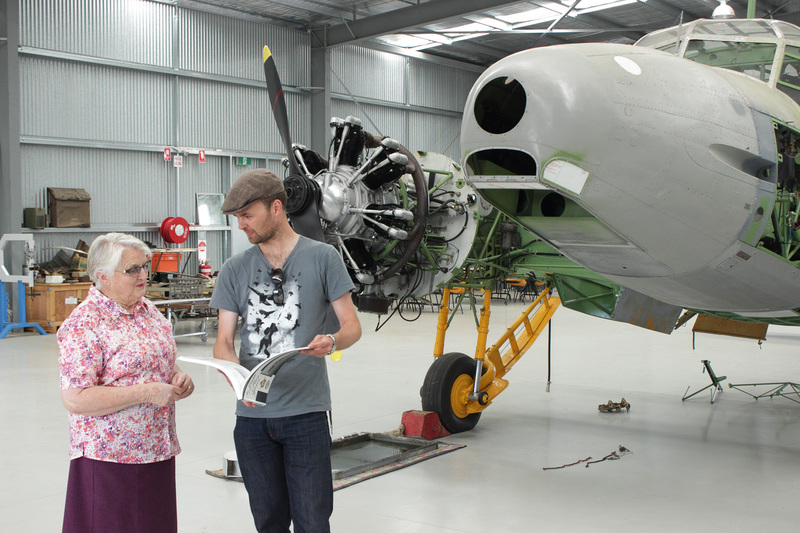 Designed and built at cost by Ahrens, a steel and industrial supply company based in Adelaide but which owns a local Nhill business, the hangar now houses the beginnings of an air museum. Joan was already there when we pulled up in front of the hangar. We paid our $5 each for admission (genuine 1972 prices!) and Joan showed us around. Pride of place in the middle is this: It’s the bones of an Avro Anson, serial W2364 to be specific. While this particular airframe was not itself based at Nhill during the war, most of the flying that took place from the airfield would have been in aircraft very much like it. 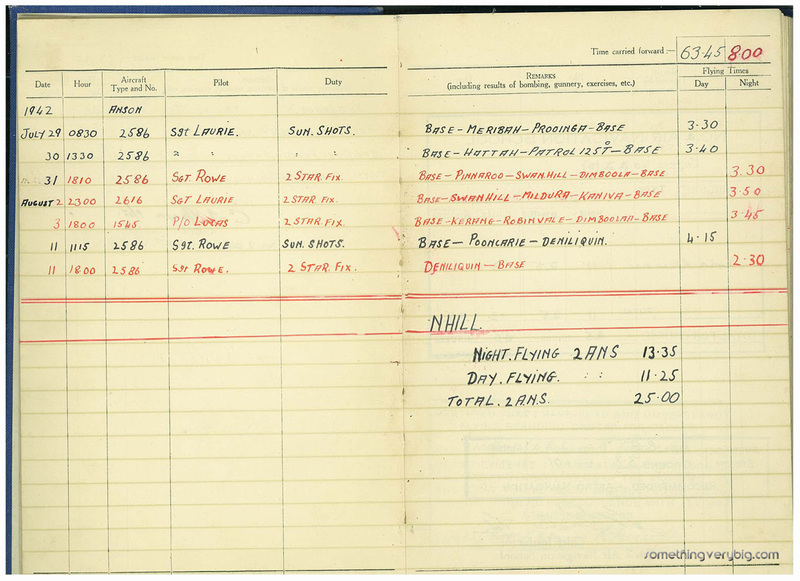 Jack Purcell’s logbook records a total of 25 hours of flying from Nhill by both day and night, over seven flights in July and August 1942. All of it was in Ansons. In recognition of Nhill’s association with Ansons, then, this one is undergoing a slow but steady and beautifully detailed restoration. Joan says the aim is to get it to taxying status and they have already got one of the engines running, evidenced by the drip trays catching oil from said engine. Over along one side of the hangar is the workshop area, where members of the group have been cleaning, repairing or fabricating components as they go. 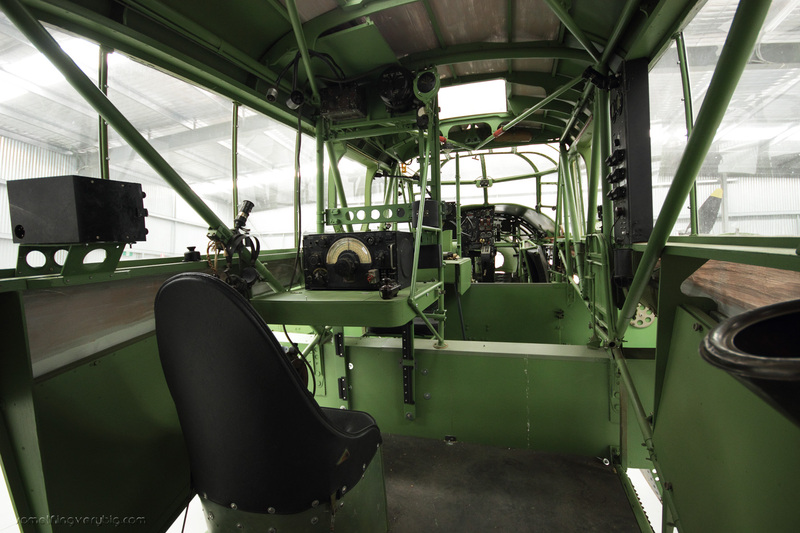 It’s taken five years and over 2,000 man-hours of work to get it to this stage and while there’s undoubtedly a very long way to go, the day in February 2014 when the work-in-progress was towed from Anson Restoration Project Manager Mick Kingwell’s shed to the new hangar was a significant one for the group and for Nhill – the first time an Anson had been on the airfield in some sixty years. 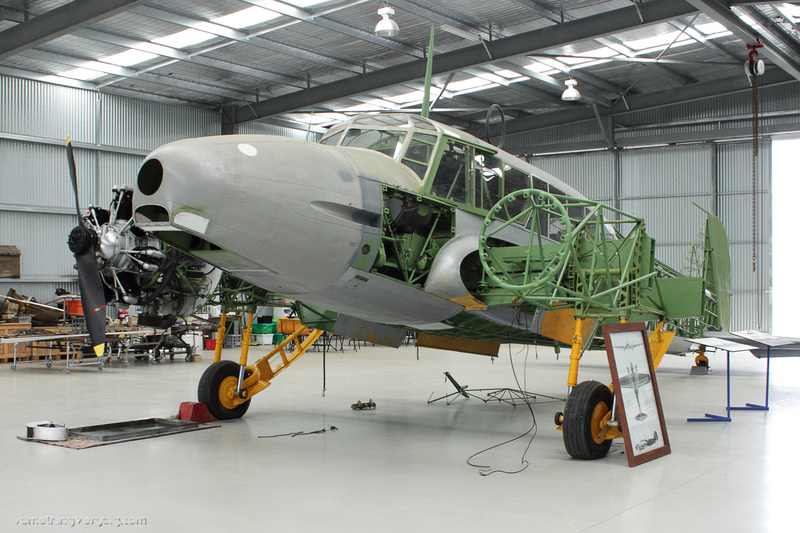 While none of the original wooden parts have been suitable for re-use on the restoration, they have been used as templates for copies to be made and the level of detail already in place inside the fuselage is quite stunning: Joan emphasised the spirit of cooperation and assistance that has come out of the aviation heritage community around Australia. A good illustration of this is the pair of Link Trainers which sit in a corner of the hangar. They both come from the same South Australian-based family. One is more complete than the other. This has been loaned to the Nhill group to restore to operating status and then to use as a template while they work on restoring the second one. Once restoration is complete the first trainer is to go back to its owners – but the second is to be retained in Nhill. Also around the airfield itself is a Heritage Trail, with sealed pathways and signage, that takes the visitor around and explains the significance of the remains of the airfield’s time as a RAAF base. While we didn’t have time to walk around it ourselves it’s another sign that good things are afoot at Nhill. There are even plans to hold a fundraising airshow at the airfield on October 10 this year (stay tuned for details – I intend to be there if I can). Given I’ve recently bought a house, my parents decided that, now I have space of my own, the time had come to go back and pick up the boxes of my old stuff which they had been keeping in their shed. So instead of flying to Canberra for the Bomber Command Commemorations in June I drove my car the seven hours up the Hume Highway. After the lunch concluded on the Sunday afternoon, I continued north to Goulburn where Mum and Dad now live. It turned out that most of the boxes in the shed contained stuff belonging to my two sisters rather than me, but I still came away with a couple of those big plastic tubs full of old trophies, documents and childhood memories. Included amongst it were two very interesting artefacts. I well remember the morning when, as a very young lad, I came out of my bedroom to get ready for school to find a long, tattered cardboard box at my place on the kitchen table. I lifted the lid in the early morning gloom to find some curling, yellowing black and white photos of a young man in uniform, an impressive certificate bearing a large, colourful royal seal and a little blue notebook, carefully inserted into a hand-made blue felt cover. The collection, my father told me later that day, all related to a man who had been my grandfather’s uncle. ‘Uncle Jack’, as Dad called him, had been killed during the Second World War. It’s far from perfect – after all it was built by a not-quite-ten-year-old boy. The decals were never square and the paint line is nowhere near straight but, apart from a couple of missing propeller blades, it’s survived its years packed away reasonably well. While Jack’s logbook is obviously the most important single source of my Bomber Command interest, the Lancaster model is also significant. When I was a little boy I wanted to be a train driver. But then I saw the logbook. Imagine if my reaction had been one of resounding indifference. But, happily, I clearly showed some sort of curiosity, so my parents decided to give me the model. And that only stoked the fires. 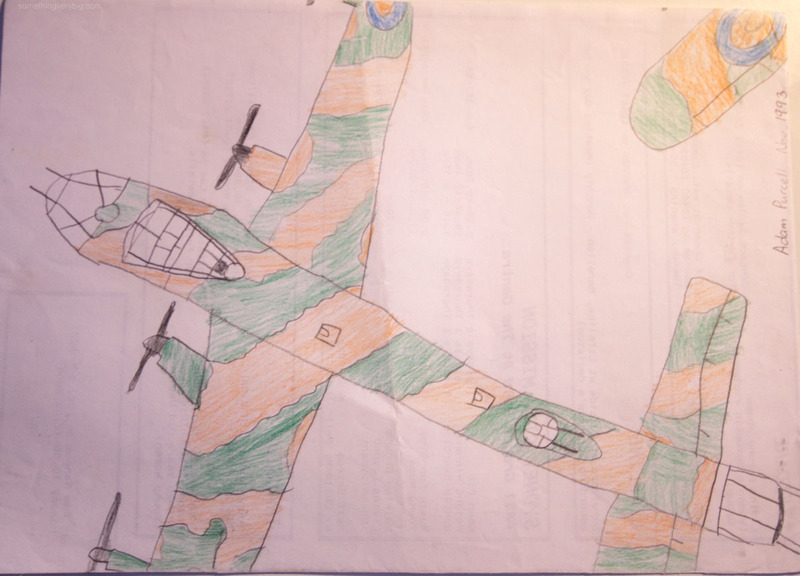 Also in one of the big plastic tubs I retrieved from Goulburn, hidden in a big folder of mass-produced pre-school paintings of green trains (and one blue signalbox, done after my teacher confiscated the green paint and told me I wasn’t allowed to paint a train) was a drawing of the top view of an aeroplane. It’s shaky and childlike but it’s unmistakeably a Lancaster. And written underneath (in my mother’s schoolteacher handwriting) is the date: November 1993. Probably not entirely coincidentally, the drawing is very close to the same size as a 1:72 scale model of a Lancaster, suggesting it was completed after I finished the model. That would imply that I probably got the model for my ninth birthday which was in August that year. Dad must have left the logbook at my place at the kitchen table some time before that. So it turns out that I’ve been interested, in one way or another, in Lancasters and the men who flew them for more than two decades. Dad gave me one more very special box to take home when I drove back to Melbourne. It’s a very small black leather briefcase that he found at an antique shop somewhere. 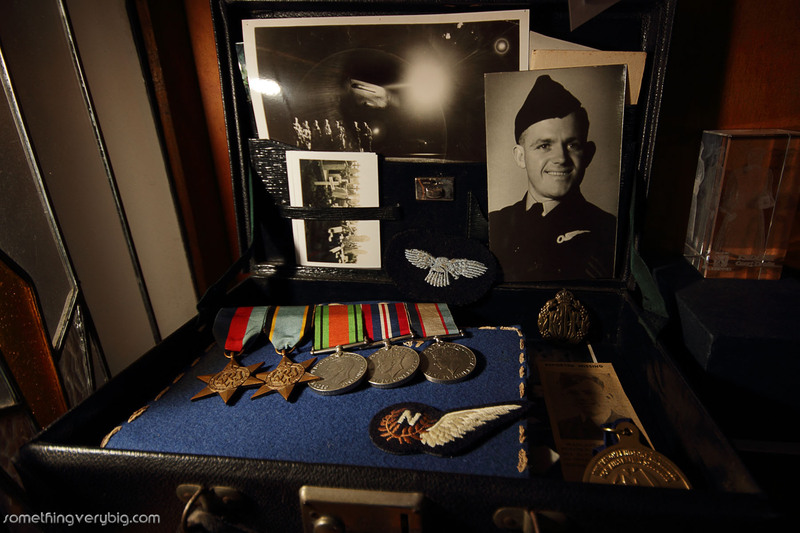 Uncle Jack’s service medals, logbook and those yellowing photos. 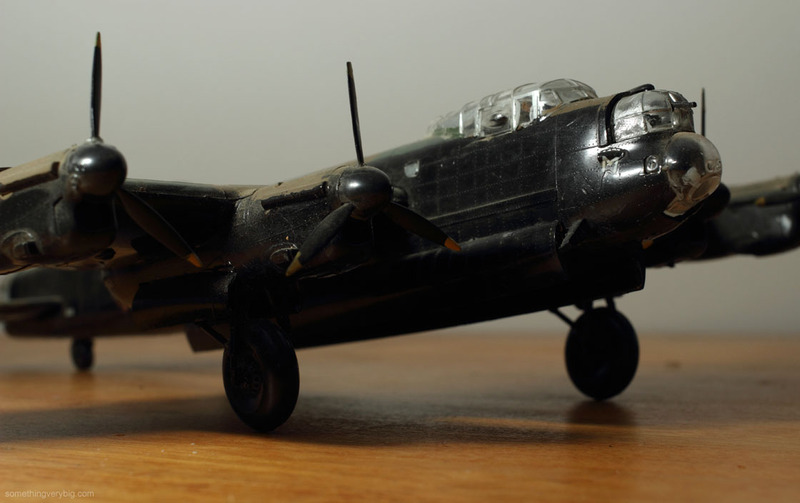 There was an article published in the Sydney Morning Herald in April 2011, about a couple of Australian aircrew who had been killed when their Lancaster crashed while on a training flight. It was 10 April 1943, and the crew was on their last exercise at 1661 Heavy Conversion Unit, Winthorpe, before being posted to an operational squadron. Shortly after take-off the aircraft crashed in the small village of Halam, eight miles from the aerodrome and aligned with the runway they had departed from. Sixty nine years later to the day, a memorial was unveiled in Halam commemorating the seven men who died in the crash. It was the culmination of some years of work by a local man named Andrew Paris who has now researched the story of the crew and how they came to be on that aircraft. Jack Purcell was posted to RAF Winthorpe between September and November 1943 and I visited the excellent Newark Air Museum that now occupies a corner of the old airfield while visiting the UK in 2009. But that wasn’t why the story in the Herald set some faint bells of recognition chiming in my mind. As part of his research Andrew had been looking for information on what the crew might have been up to during their time at 1661 HCU. I got in touch with him through the Lancaster Archive Forum and was able to share an extract of Jack’s logbook covering the time he had been at the unit. While only a very small piece of the overall story, every little bit helps towards developing an understanding of ‘what they were doing there’. It’s another good demonstration, I think, of how the Internet has revolutionised historical research. The reach of the web is world-wide, and it’s made finding this information much easier because it’s now a simple matter to find someone on the other side of the world who might have the information that you seek. And it’s then made it very easy to share the results of your work with a much greater audience than in the past.